Pictured are: first row from left, Paige Martinez, Ally Pierce, Tessa Armstrong, Jennah Adams, Katie Harris; second row from left, Brandon Ebert, Grant Hower, Reid Taylor, Jacob Upchurch; third row from left, Gabe Johnson, Troy Brown, Nick Agerter, Christian Walton and Advisor Thomas Russell. 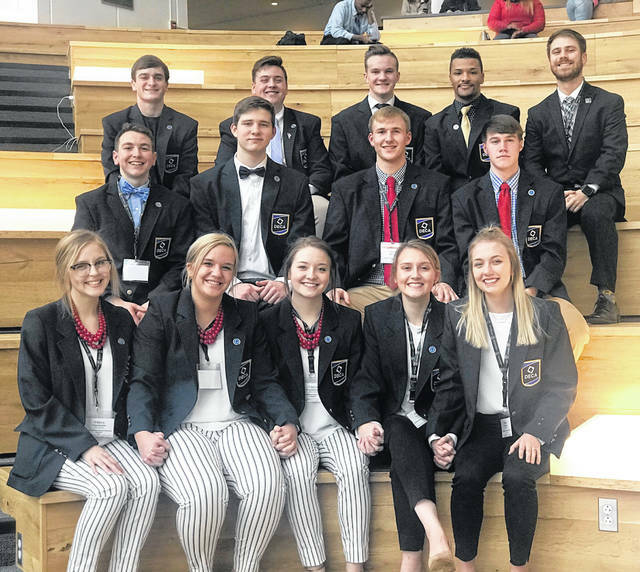 On March 15-16, 13 students from Urbana High School traveled to Columbus, Ohio to compete in the 75th Ohio DECA Career Development Conference. These students competed in various business and marketing events against the best Ohio DECA has to offer. Nine of these 13 students earned positions as finalists, meaning they placed in the top-10 of their respected events. Each of the students presented to a judge and were scored according to their individual event rubric. Series and Team Decision Making events occurred in the form of case studies, while other projects required a 10-20 page paper and a 15 minute presentation. Some projects consisted of marketing research campaigns focusing on Game Time Sports Center and Tommy Brooks Salon, while another group created a Start-Up Business Plan over a drone company. Case study events were covered in the fields of Entrepreneurship, Retail Management and Business Law & Ethics. The teams reaching the top 10 are as follows – Jennah Adams and Katie Harris in Business Services Operations Research, Tessa Armstrong, Paige Martinez, and Ally Pierce in Sports and Entertainment Marketing Research, Brandon Ebert and Grant Hower in Business Law and Ethics Team Decision Making and Reid Taylor and Jacob Upchurch in Entrepreneurship Team Decision Making. Other competitors included Troy Brown and Gabe Johnson in Start-Up Business Plan, Nick Agerter in Entrepreneurship Series, and Christian Walton in Retail Management Series. The Urbana DECA Chapter will travel to Orlando, Florida for the International Career Development Conference and participate in the Emerging Leaders conference at the end of April. Thomas Russell is the DECA advisor at Urbana High School.